Many of the co-op games you hear about here on Co-Optimus are fairly big console based titles, or the occasional PC release, that receive a ton of press attention. However, there is a wealth of co-op opportunities out there for the co-op gamer that goes looking a little further. 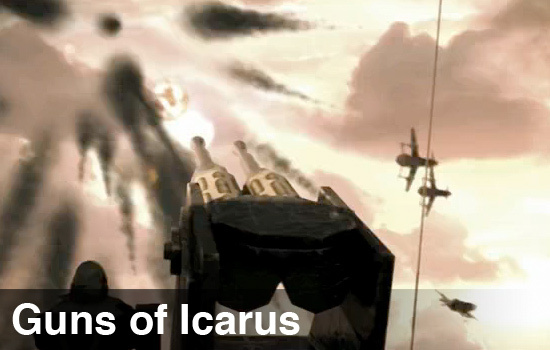 Muse Games’ Guns of Icarus is one such title that offers a four-player co-op experience in an easy to access, and fun to play, web-browser based package. You are the pilot of a zeppelin, the Icarus, which travels across a vast and barren landscape delivering goods to the needy survivors of some apocalypse. The journey is not an easy one, however, as greedy pirates will plague you along every meter of your route. 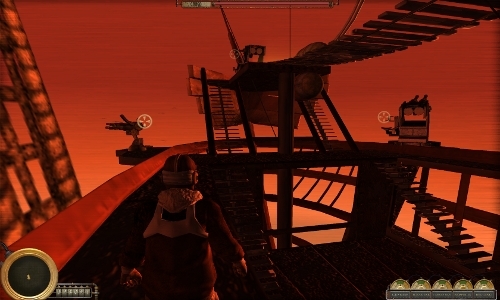 Your only means of protection from these air pirates are the titular guns of your airship, which start off fairly weak but access to better guns become available as your complete each stage of your route (i.e., level). You’re able to choose the route you wish to follow, with each stage offering a different level of difficulty and a different set of rewards for making it through with a certain percentage of your cargo still intact. Once you’ve selected a route, the game ends up playing much like a fixed location survival mode. Your on-screen avatar runs from gun-to-gun shooting down the next wave of enemies using the usual keyboard/mouse combo of WADS to move and the mouse to interact with objects, aim, and shoot. Your zeppelin will inevitably be hit by enemy fire and five gauges at the bottom of the screen keep track of the amount of damage each portion of your airship has received. Damage to each portion has a specific effect, thus if your engines fail, you no longer move forward and you’re dead in the air. Damage to the cargo space results in a loss of cargo, which is needed in order to get rewards at the end of a level, and if the zeppelin itself takes too much damage, you fail the level. Fortunately, you’re able to repair the different sections of the ship by running to the appropriate repair point, clicking the mouse, and waiting as the repair bar slowly fills up. Of course, the enemy doesn’t stop attacking while you’re doing this, so here’s where the real balance of the levels comes into play. Do you let your engines just sit there damaged while you down some enemy planes, or do you get them up and running again so you can get the hell out of there? Do you wait to repair your cargo hold, or do you keep it in the green the whole time and let other parts of your ship go in the red? Bringing a buddy or two along to help out is definitely recommended. The co-op portion of Guns of Icarus plays out much the same as the solo campaign, with two key exceptions. First, while players have access to all the same levels as they do in the solo campaign, there isn’t the same level progression that you have in the solo campaign. Instead, players set up their own games (making them private or public) and select which level they wish to tackle. Second, players don’t get to choose which weapons they wish to use, or where they’re placed. Each level in the co-op mode comes with a pre-determined selection and placement of weapons, meaning you’re stuck with whatever you’re given. The co-op maps become even more like survival/challenge maps, where you and your friends are playing to see how well you can do with what you’re provided. While it’s disappointing that players can’t progress through the campaign in the same fashion or choose how they want to equip their zeppelin, it doesn’t really hurt the co-op aspects of the game. The one area where Guns of Icarus falls flat is the way players communicate with one another. Understandably, a web-based game doesn’t have a voice chat option so players must coordinate by typing things out in a chat box. Personally, I find it rather hard to type out any kind of strategy to my teammates while under heavy enemy fire. Even if I did get something typed out, the chat box is located a little below the game window and not something you’d see unless you scroll down some in the browser window. Some kind of auto-message system that would allow players to display “I’ve got this gun,” or “I’m repairing this,” on the game screen would go a long way in helping with the communication problems. Muse Games offers much of Guns of Icarus for free on its website, with the full game, which includes all the levels, guns, and free downloads of the game for PCs and Macs, costing $8. From now until January 1, however, Muse is running a special deal and interested gamers can get the full game for just $5, which is a very fair price for a game like this. Overall, Guns of Icarus offers a fun, compact game experience that is only really limited by the platform it uses.